Inspiration for Tony's Tropical Tiki Bar has come from the Bahamian paradise known as the Abaco Islands. Below are a few videos for your enjoyment about Abaco. The 1st is a video of beautiful Tahiti Beach on a party day. We have been at this location where we have had it all to ourselves. It is true paradise. 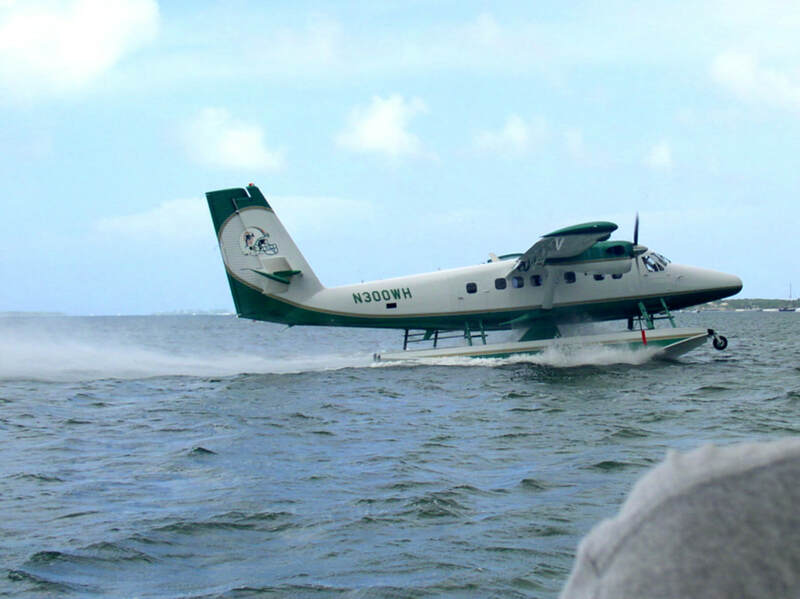 This video was taken as we circled the beach in our seaplane. There are many coconut palm trees all along the beach but from the air you can't really see them. When you are on the ground you feel like you could be in Tahiti itself surrounded by the palms. Now a little history about what it's like in Abaco. In 1980 George Nowak(Barefoot Man) told me about it while we sat at a bar in the Caymans. I never heard of it but kept it in the back of my mind to get there one day. Now Barefoot lives on the beach in the Caymans but still goes to Abaco a few times a year for vacations and get aways. That should tell you something. In Abaco the outer cays off the mainland travel is by golf cart on each islqnd and by boat to go from one island to another. Land is always within sight. 3 out of 4 islands are deserted with beautiful beaches and the ones with residents usually have beach bars to enjoy as well as friendly people. You are in another world but less than 1 hour from Florida by plane. To sum it up for example, the 2 pictures below are of a sea plane that buzzed us no more than 50 yards over our boat while we were going to a beach bar at Lubbers Quarters, an outer cay. At this island there were only 15 residents and 2 beach bars. It turned out that the plane was the owner of the Miami Dolphins who came there for lunch and then flew back to Miami. The night before 10 players and their girlfriends were there for a full moon party. Again you are in another world but so close to home. It's like heaven on earth. Watch this next video to see what the entire Abacos is all about. This shows EXACTLY what I'm talking about when I talk about deserted beaches and crystal clear blue water. The next 2 videos are about Nippers, the famous beach bar that our pig roast was inspired by. Nippers holds an all day & night pig roast at their beach bar every Sunday. It is attended by locals and tourist that come from throughout all the islands in Abaco. The rum punches flow as you sit on a bluff overlooking one of the most beautiful beaches around. Even though the only way to get to Nippers is by boat, it will be jammed packed on a Sunday; & "One Hell Of A Goodtime" This is what is known as a true "SWIM UP BAR", as you can see in the video, people just anchor their boat by shore and jump overboard to swim to shore and the bar. It is common for everyone to be swimming in the ocean with their rum punches and beers. The 2nd video is a documentary by Barefoot Man whose music plays in my bar throughout the day, everyday. Barefoot lives on the beach in the Cayman Islands but still comes back to Abaco a couple times a year for his vacations. These next 2 clips are from the TV show Scrubs where the cast members had the privlege to sit on the exact same bar stool at Hopetown Harbor Lodge beach bar; and sit in the exact same spot on the beach that Tiki Tony sat at many times during his stays in Hopetown, Elbow Cay, Abaco. They're so lucky!!! ​The following music videos were made in the Abacos. The first video is to pay tribute to Aaliyah who died in a plane crash in Abaco after the shooting of this music video. For those country music lovers the next 2 videos are from country artists. The 1st is People are Crazy by Billy Currington. This video is a beautiful, meaningful song, shot at Green Turtle Cay and The Tipsy Turtle beach bar at Treasure Cay. The 2nd is "Right Here Right Now" by Scarletta. This was shot at Treasure Cay beach and Green Turtle. Treasure Cay Beach is ranked one of the 5 Best beaches in the World. The next video is Jimmy Buffetts tribute to Hopetown Harbor at Elbow Cay, Abaco. This was the small island we lived on for two of our Abaco vacations. Jimmy even had the Hopetown lighthouse as a backdrop as he sang in concerts.